And I’m having a good day. Traditionally the holidays of local bogi (gods) were a time for the volkvi (shamanic priests) to perform a divination for the coming year. So, at 12:05 AM I entered a trance with the intent to receive a vision of the future for the next year. What I saw was me falling from a great height through a bunch of trees and becoming quickly acquainted with the ground. Then it cut to me riding on a large bear as we travel a path in the forest. It meant that I’d recently taken a dive in my transfer to Slavic Paganism, I had become like The Fool again. But with Bog Veles’ help (the bear is an image of Bog Veles) I would be able to go down the path I’m meant to. 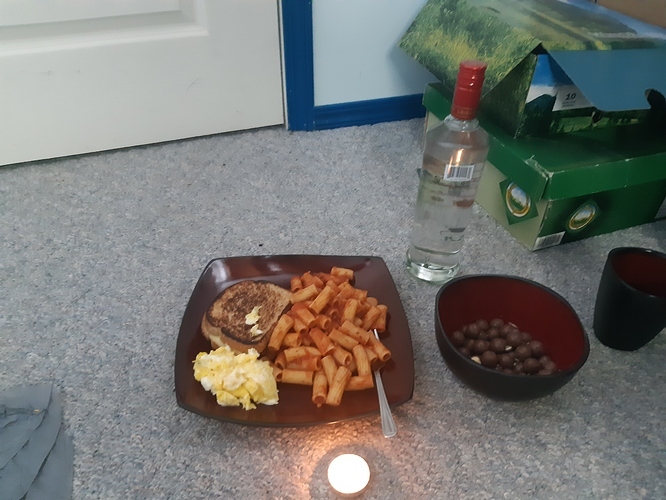 I also made him a dinner for an offering: a grilled cheese sandwich, rotini pasta with garlic aioli sauce, and scrambled eggs. I also bought solely for his offering, a bag of maltesers, and a bottle of vodka. It is said that the six days following his holiday, something good will happen to those who have worked with him throughout the year. So, I am anxiously anticipating what good thing he has in store for me. Were the Slavs close to the old Germanic pagans of pre-Christian times? Slavs are an absurdly large people group, but yes, some Slavs encountered the Germanic tribes. I was going to say, when the energy of the picture hit me. I felt a some similarities. Very cool. I also wrote this over on my Rodnovery journal. I’m glad that you’re able to feel the energy from the offering as well. I took that picture after the ritual, so it’s like a beam of Bog Veles’ energy.